Biography, Paintings of Pre-Raphaelite Painter. An important figure in Victorian art, and one of the best English painters of the day, Ford Madox Brown was probably the definitive painter of the Pre-Raphaelite Brotherhood (despite being on the fringes of the group) because of his style and choice of subjects. Certainly, he was highly respected by other Pre-Raphaelites, in particular Dante Gabriel Rossetti (1828-82). Brown is noted for his modern paintings dealing with contemporary social issues, and his later works of brilliant colour painted on bright white canvases. About 1853, after being shunned by the arts authorities for his social conscience, he stopped trying to exhibit at the Royal Academy annual group show and, instead, pioneered the concept of the one-man show. An active participant in the Arts and Crafts Movement, he was a founder member of Morris, Marshall, Faulkner & Co - the design firm set up by William Morris - his specialty being stained glass art and furniture design. His final project was the completion of a series of twelve mural paintings for Manchester Town Hall, showing the history of the city. His best known works include Lear and Cordelia (1849-52, Tate Collection, London); Chaucer at the Court of Edward III (1851, Art Gallery of New South Wales); The Last of England (1852-56, City Art Gallery, Birmingham); and Work (1852-65, Manchester Art Gallery). He was born in France, in the city of Calais, and at the age of fourteen, was taken by his father to the Bruges Academy to study art. Later, he completed his artistic training at the Antwerp Academy under the history painter Gustave Wappers (1803-74). In 1840, he settled in Paris, where he studied drawing, and copied the Old Masters in the Louvre. Returning to London in 1844, he entered a competition for the commission to decorate the interior of the Houses of Parliament. In 1845, following the rejection of his designs he left London for Rome, stopping in Basel on the way, where he discovered the German Renaissance portraitist Hans Holbein (1497-1543), whose brilliant colours had a significant impact on his work. While in the Italian capital, he came into contact with the German Nazarenes, especially with Johann Friedrich Overbeck (1789-1869) and Peter von Cornelius (1783-1867), whose spiritual aesthetics had an influence on Brown's fine art painting. Brown returned to London in 1848, and began tutoring Dante Gabriel Rossetti, who became a lifelong friend and admirer of his work. 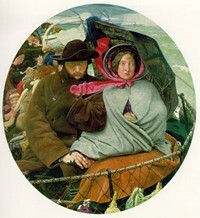 During this period he painted two of his most important works of English figurative painting: Work (1852-65, Manchester Art Gallery), an acidic and critical allusion to Victorian society, and The Last of England (1852-56, City Art Gallery, Birmingham), calling attention to the unemployment and massive emigration that took place in England in the second half of the 19th century. He also perfected the use of rich, vivid colour in painting and established a reputation for his painstaking method of work. However, his pictorial denunciation of harsh social injustice, allied to his antipathy towards academic art, earned him a poor reputation with the arts hierarchy, with the result that he never showed his work at the London Academy. Through Rossetti, Brown met the other artists who went on to become the Pre-Raphaelites, including William Holman Hunt (1827-1910), John Everett Millais (1829-96) and Edward Burne-Jones (1833-1898). Despite their artistic closeness - like them, Brown believed passionately that art should be true to nature and morally uplifting - he was never fully inducted into the group, although he did become the driving force behind the Hogarth Club, a short-lived replacement for the Pre-Raphaelite Brotherhood (PRB) which appeared for three years between 1858 and 1861. Despite being on the fringes of the PRB, Brown remained close to Rossetti, who inspired him to switch from contemporary to historical and literary paintings. As a result, Brown began to devote himself to Romanticism, focusing on medieval and sentimental subjects, taken from the literature that was in vogue at the time, particularly the works of Sir Walter Scott and Lord Byron. During the late 1850s, Ford Madox Brown had collaborated on several projects with William Morris, the champion of applied art and chief spokesman for the Arts and Crafts Movement. Then in 1861 he became a founder investor in William Morris's design company, Morris, Marshall, Faulkner & Co, for whom he designed a range of stained glass windows, as well as a variety of hand-made furniture. He alternated his crafts activities with book illustration and oil painting. By the 1870s Brown was sufficiently established as one of London's top painters and practitioners of decorative art, that he purchased a large house in fashionable Fitzroy Square, central London. In 1878, Brown was awarded his final major project, a mural painting - actually twelve large fresco paintings known as the "Manchester Murals" - for the Manchester Town Hall, a work which he finished in 1887 and which illustrated some of the city's historic events. He died in London at the age of 72, and was interred at St Pancras and Islington Cemetery. Works by Ford Madox Brown hang in several of the world's best art museums, including the Tate Collection, London; Manchester Art Gallery; City Art Gallery, Birmingham; Delaware Art Museum, and the Art Gallery of New South Wales.  For biographies of other Victorian English artists, see: Famous Painters.  For more details of 19th century painting, see: Homepage.